Boston Marathon Racing Tips | Run S.M.A.R.T. We asked Run SMART coaches Heidi Peoples and Ann Alyanak for some last minute Boston Marathon tips. Both coaches know the course well. Ann was 8th female overall at Boston in 2007 and Heidi ran 2:45 at Boston in 2010. 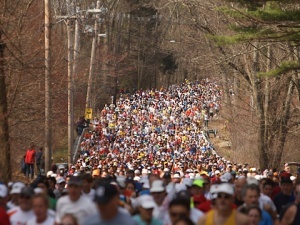 Heidi Peoples: The Boston Marathon is an incredible event but can definitely be overwhelming. I felt like an ant in an anthill following crowds to the expo, church, subways, dinner, and even the hotel. Everyone seems like they are going the same place, doing the same things to prepare for the marathon. Mentally it can be exhausting! Since I ran in the elite field of women, my experience was a bit unique – no crowds at the start, and the field of women separated rather quickly. I went out fast to stay with a group, and paid for it at the end of the race. Heartbreak Hill is tough but not because it is a steep or endless hill. I think the greatest factor is the point at which this hill arrives – Mile 20 – definitely a breaking point where a bear can come out of no where and jump on your back! Be conservative for the first half of the race – DO NOT GO OUT TOO FAST – even though the downhill and enormous amount of fans may tempt you to do so. Use the crowd support to motivate you. Wear a shirt with your name on it and you will have a lot of people cheering for you along the way. Ann Alyanak: When you start the Boston Marathon be prepared to pretty much drop out of the sky for the first mile. The first few miles are a serious downhill and you need to be very conservative at the start. You may think that you can bank time during these early miles because it is downhill but that is not the case. Stick to your goal pace at the beginning and even though it may feel very easy and relaxed, you are helping yourself for the later stages in the race. You are conserving some energy by sticking to your pace and not beating the legs up as much by trying to run faster on the downhills. When I ran Boston in 2007 I was able to negative split the race and run faster over the second half. I really held back for the first 10 miles or so. I felt great when I reached the Newton Hills and was able to run strong to the finish. I attribute much of this to being very prepared but also being smart at the start and not getting carried away. The crowds and support at Boston are amazing and you want to enjoy them but don’t let all this energy cause you to run faster than your goal pace either. Stick to your plan and focus more on using the energy of the crowd later in the race to get you up the hills and to the finish line.